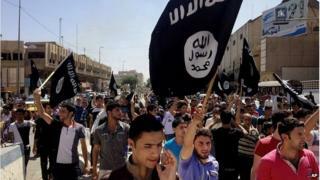 Two Iraqi journalists have been killed by Islamic State (IS) in the past four days, Reporters Without Borders says. Mohanad al-Akidi, the correspondent for the Sada news agency in the IS-held northern Iraqi city of Mosul, was shot dead at the Ghazlani base on Monday. Mr Akidi was abducted in July while he travelled to Dohuk province. On Friday Raad Mohamed al-Azzawi, a cameraman for Sama Salah Aldeen TV, was beheaded by IS militants in the city of Samarra. He had been held for a month. Reporters Without Borders, which promotes and defends world media freedom, said it was "horrified by the jihadist group's constant crimes of violence". "Islamic State is pursuing a policy of indiscriminate criminal violence that shows no pity towards journalists and does not hesitate to kidnap, torture and murder them," said its programme director, Lucie Morillon. "Media personnel need the support and protection of the local authorities more than ever," she added. The vast majority of foreign journalists have fled the large parts of Iraq and Syria controlled by IS because of the danger, leaving local reporters to document events. IS has beheaded the American journalists James Foley and Steven Sotloff in the past two months, and is holding the British journalist John Cantlie, who has appeared in a series of propaganda videos. Earlier this month, IS issued guidelines for journalists operating in the Syrian province of Deir al-Zour. They were told to swear allegiance as "subjects of the Islamic State", submit stories for approval, and inform the group of any social media accounts. Anyone violating the guidelines will be "held accountable". Reporters Without Borders said Mr Azzawi had been threatened with death by IS in September because he refused to work for the group.